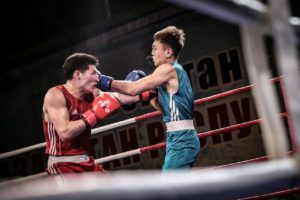 The 27th edition of the Kazakhstan National Boxing Championships was held for the male elite boxers in the city of Aktau. Besides to their top stars members of the new generation such as 19-year-old Sanatali Toltayev and Bek Nurmaganbet also won their weight classes in the seven-day long Kazakhstan National Boxing Championships. Aktau located off the coast of the Caspian Sea and hosted the traditional Shokhr Boltekuly Memorial Tournament and the Kazakhstan Junior National Boxing Championships in 2017. Altogether 198 male elite boxers attended in ten weight classes of the Kazakhstan National Boxing Championships in Aktau. Neutral European referees & judges have been also worked in the Kazakhstan National Boxing Championships in Aktau. Kazakhstan Boxing Federation was invited AIBA 3-star Referees & Judges such as Hungary’s Mr. Gyorgy Hidvegi, Estonia’s Mr. Jakov Peterson and Italy’s Mr. Carlo Franchi. Amman 2013 ASBC Asian Champion Temirtas Zhussupov walked over to the final of the light flyweight (49kg) as his semi-final opponent Hamburg 2017 AIBA World Boxing Championships bronze medallist Yerzhan Zhomart was unable to box against him. The 30-year-old veteran impressed in the Season VIII of the WSB and Yermek Madiyev was not able to stop him in the first final of the event. The flyweight (52kg) is a relatively weak point in Kazakhstan, their Jakarta 2018 Asian Games competitor and Islamic Solidarity Games winner Azat Makhmetov claimed only bronze medal in Aktau. Anvar Muzaparov was able to beat Makhmetov in the semi-finals and his skills were enough to triumph over WSB Team Champion Saken Bibosynov in the final. Kairat Yeraliyev is the defending AIBA World Champion at the bantamweight (56kg) but he lost in the preliminary round of the Jakarta 2018 Asian Games. The experienced star worked better in the national event and for the gold medals he defeated 20-year-old Orazbek Asylkulov who eliminated Incheon 2014 Asian Games winner Ilyas Suleimenov in the last 16 of the National Championships. The lightweight (60kg) saw the battles of the generations in Kazakhstan where WSB Team Champion Zakir Safiullin had to meet for the title with AIBA Youth World Boxing Championships silver medallist Samatali Toltayev. The 32-year-old Safiullin was slightly better than his teenage rival while former National Champions as Yerzhan Ordabayev and Adilet Kurmetov lost their preliminary contests in Aktau. Samatali’s twin brother ASBC Asian Youth Champion 19-year-old Sanatali Toltayev landed lethal punches in the final of the light welterweight (64kg) when he faced with Tashkent 2017 ASBC Asian Confederation Boxing Championships bronze medallist Bekdaulet Ibragimov. The ringside doctor finished the bout in the second round confirming Toltayev’s success while WSB team member Dilmurat Mizhitov was not able to get any medal in Aktau. The welterweight (69kg) is Kazakhstan’s No.1 boxing field, the country claimed the last four gold medals in the Olympic Games since 2004. Hamburg 2017 AIBA World Boxing Championships bronze medallist 21-year-old Ablaikhan Zhussupov had a close final against two-time WSB Team Champion Aslanbek Shymbergenov and the younger hope regained his top place in Kazakhstan. Hamburg 2017 AIBA World Boxing Championships silver medallist Abilkhan Amankul eliminated a top rival in the semi-final Tursynbai Kulakhmet and after that he was confident for the title against Tashkent 2017 ASBC Asian Confederation Boxing Championships silver medallist Yerik Alzhanov who returned to the middleweight (75kg). AIBA Youth World Boxing Championships silver medallist Bek Nurmaganbet won his first national elite title in Aktau. The young light heavyweight (81kg) boxer eliminated Timur Yerzhanov in the semi-final and walked over to the gold medal against another 20-year-old athlete Mikhail Kokhanchik. Rio 2016 Olympic Games silver medallist and three-time ASBC Asian Champion Vassiliy Levit is one of the most experienced heavyweight (91kg) boxers in the whole world. The 30-year-old star had a competitive final opponent but he is still too experienced for AIBA Youth World Boxing Championships bronze medallist Bekzat Nurdauletov. Kazakhstan’s best super heavyweight (+91kg) boxer Hamburg 2017 AIBA World Boxing Championships silver medallist Kamshybek Kunkabayev was in different level than any of his opponents in Aktau. The 190cm tall boxer defeated 21-year-old Nurlan Saparbay in the final of the last category while Yerzhan Seytimbetov and 20-year-old Ayboldy Daurenuly achieved bronze medals in Aktau.